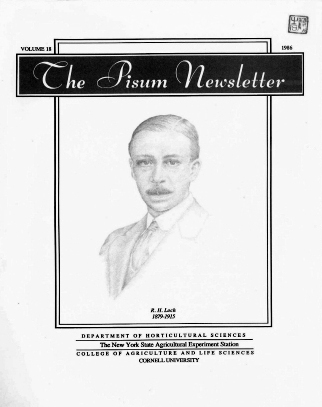 R. H. Lock, whose likeness is depicted on the cover, made several important early contributions to the genetic literature of Pisum. Born and educated in England, Dr. Lock spent his most productive scientific years in Ceylon (now Sri Lanka) at the Royal Botanic Garden, Peradenyia. He died at an earlv age (36) but not before be published about twenty papers (four of which are relevant to pea genetics) and two books. His book, "Recent Progress In the Study of Variation, Heredity and Evolution", first published in 1906, endured through four editions. Because he received his graduate training during those extraordinary days when Mendel's work was rediscovered, and because he enjoyed the confidence and encouragement of William Rateson, Lock undertook to confirm and extend Mendel's findings. This he did with consummate success. His 1908 paper, "The present state of knowledge of heredity in Pisum", summarises what was known about the subject at the time. Incidentally, many of the populations analyzed by Lock came from crosses made by Batesou, thus emphasising the close tie between these two pioneerinc workers. Tn his work with peas Lock not only confirmed the work of Mendel but also demonstrated the phenomenon of epistasis, added a number of new genes to the original seven described by Mendel, and commented upon the question of species and phylogenetic relationships. Moreover, he was the first to use descriptive symbols for Mendelian genes. SEED PROTEIN PRODUCTION OF SOME PISUM MUTANTS AND RECOMBINANTS. THE EFFECT OF THE GENOTYPE ON IN VITRO ROOTING OF PEA SHOOTS. EFFECT OF YEAR AND SPACING ON COMBINING ABILITY IN PEA. BRANCHING IN PISUM: EFFECT OF THE FLOWERING AND LENGTH GENES. THE REACTION OF PISUM GENOTYPES TO EXTREME SHORT DAY CONDITIONS. HEP 4, A HIGH YIELDING LEAFLESS STRAIN OF PEA. GEOGRAPHIC ORIGIN OF PEA SEEDBORNE MOSAIC VIRUS: AN HYPOTHESIS. LOCALIZATION OF NITRATE REDUCTION IN SOME PISUM GENOTYPES. VARIATION IN NODULATION CAPACITY OF PEA VARIETIES. ARTIFICIAL POLYPLOIDS OF THE PEA. ADDITIONAL MUTANTS DEFECTIVE IN NODULATION. A NEW INTERPRETATION OF HAMMARLUND'S K-LINE. LATERAL ROOT INITIATION IN RHIZOBIUM INOCULATED PEA SEEDLINGS. LOCATION OF er PROVING ELUSIVE. TENDRILLED ACACIA (tac): AN ALLELE AT THE uni LOCUS. BY A LOCUS ON CHROMOSOME 1. A GENERAL DESCRIPTION OF POD DEVELOPMENT IN PISUM SATIVUM. GENES IN HOMO- AND HETEROZYGOUS CONDITION. (DGV) STUDIED BY MEANS OF THE C-BANDING TECHNIQUE.